GasLog Ltd. (GasLog) confirms it entered into new charter party agreements for two dual-fuel carriers, each for a firm period of seven years, with a wholly owned subsidiary of Cheniere Energy, Inc. (Cheniere) at the end of 2018. Samsung Heavy Industries (SHI) is constructing the vessels. 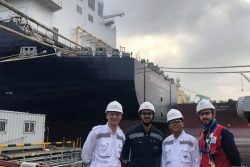 To fulfil the Charters, two 180,000 cubic meter LNG carriers (HN 2311 and HN 2312) with dual-fuel low-pressure two stroke engine propulsion (LP-2S) propulsion and GTT Mark III Flex Plus cargo containment systems have been ordered from SHI in South Korea, with expected delivery in mid-2021. The Charters build on GasLog’s existing relationship with Cheniere, which now totals four newbuilds on order and the GasLog Partners LP-owned GasLog Sydney, which is currently on a multi-year time charter. Paul Wogan, Chief Executive Officer of GasLog, stated, “I am delighted to build further on our existing relationship with Cheniere. The four newbuilds that we now have on order for them will provide further support for their leading position in US LNG exports.